Jerry Ahern penned a number of action-adventure series' including 'Track', 'Takers' and the post-apocalyptic 'The Survivalist' run. 'The Defender' ran 12 volumes from 1982-1990. 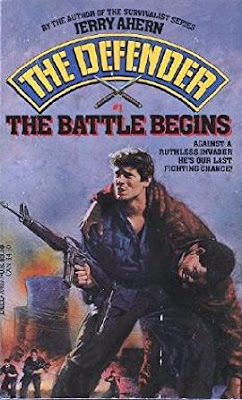 Some readers had complained about a right-wing bias in this debut, “The Battle Begins”, so I was looking for one but never really found it. I had no problem with the premise of this book (the co-hero is a black guy, by the way), since heavily-armed vigilante crime-fighting is pretty much what men's action-adventure fiction is all about. In this one, Soviet agents use American street gangs to slowly strangle lawful authority in America, gradually taking over the country with shock massacres and terrorist attacks. Military veterans and other law-and-order devotees band together to resist, even though the law sees them as armed criminals who are just as dangerous as the terrorists! There’s plenty of dramatic potential here, but somehow it never really worked for me (although the book does conclude with a pretty good action sequence, a counter-attack at a nuclear reactor). It’s not the fault of the plot or the characters. I’m not sure Ahern’s style is well-suited for what should be a breathless, fast-paced action tale. Maybe he’s just laying a lot of ground work for future installments of this saga. I hope so. The book isn’t bad. But I wasn’t as engaged in it as I wanted to be.